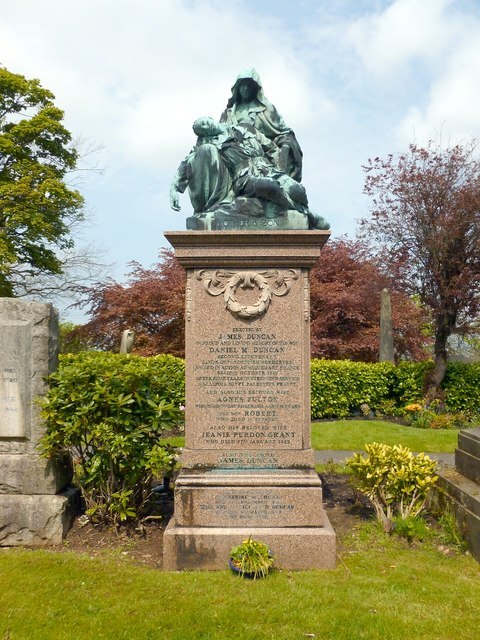 The memorial is on the northern side of the Broadwalk, the avenue that runs along the summit of the hill on which Woodside Cemetery is laid out (NS4663 : Woodside Cemetery: the Broadwalk); for further context, it can be also seen in a view of NS4764 : Paisley Crematorium. "Erected by James Duncan in proud and loving memory of his son Daniel M Duncan, Second Lieutenant, King's Own Scottish Borderers, killed in action at Sequehart, France, Second October 1918, after four years of strenuous service: Gallipoli, Egypt, Palestine, France." "And also his beloved wife Agnes Fulton, who died 3rd December 1918, aged 61 years." "His son Robert who died in infancy." "Also his beloved wife Jeanie Purdon Grant, who died 27th January 1927." Later generations of the family are also commemorated on the stone. As the inscription reveals, Daniel M Duncan died when the war was almost at an end, and his grief-stricken mother (Agnes Duncan née Fulton) died only two months later. This family tragedy is alluded to by Joseph Whitehead's sculpture NS4763 : Mother & Son, which crowns the memorial. © Copyright Lairich Rig and licensed for reuse under this Creative Commons Licence. This page has been viewed about 197 times.